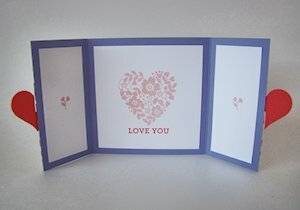 Add a locking element to a classic gate fold card. 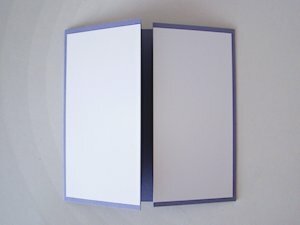 To make the card base, start with an 8 1/2” x 4 1/4” piece of cardstock. On the long side, score at the 2 1/8” and 6 3/8” marks. Fold the card base along the score lines. Cut TWO 2” x 4” front panels from coordinating cardstock and adhere them to the card base, making sure they meet in the middle. 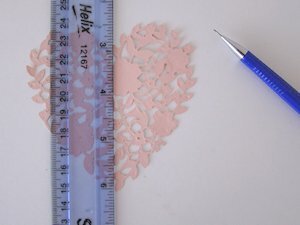 Punch or die cut a symmetrical shape approximately 3-1/2” wide. Use a pencil and ruler to make a line down the center. Cut along the pencil line. Adhere the cut pieces to the front of the card, making sure they meet in the middle. Punch or die cut TWO shapes approximately 1-1/2” in width. 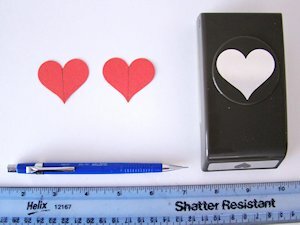 Use a pencil and ruler to make a line down the center of both pieces. Cut a slot slightly more than halfway up on one shape and slightly more than halfway down on the other. 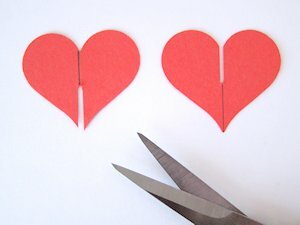 Interlock the two shapes together with the slotted cuts, making sure they can align evenly. 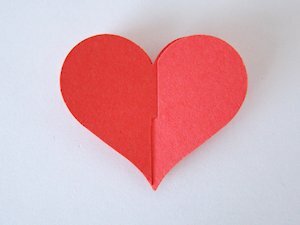 While keeping the shapes interlocked, put adhesive on the back of the hearts. Be sure not to get any glue near the slots. Adhere the interlocked pieces to the front of the card, making sure the slots align with the opening of the card. 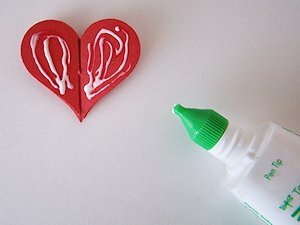 If using glue, give the glue a chance to dry before opening the card. 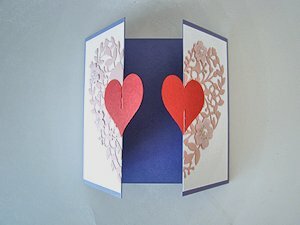 Open the card by pulling slightly up one side and slightly down on the other. For the inside panels, cut a 3-3/4” square for the middle and TWO 1-5/8” x 3-3-/4” for the sides. Stamp as desired. Embellish the front of the card as desired to complete the project. You've seen the tutorial, now you try it! We've got a section of the gallery set aside for Interlocking Gate Card. 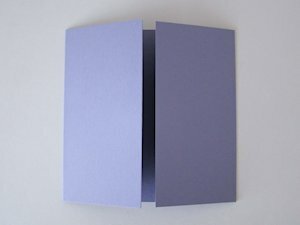 Try this technique, then upload your artwork to the gallery. Show us your creations! Thank you for showing that! 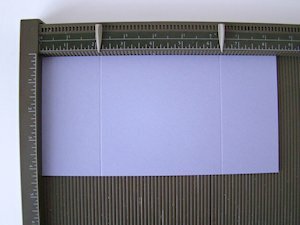 I've been trying to figure out how to interlock something on the front of a gate fold card but never thought of doing it that way. 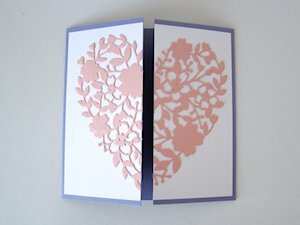 I was trying to use 2 different die cuts (like butterflies) but the card would never stay shut. 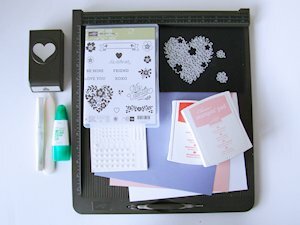 I haven't been making cards for very long ( a few years) and still feel like a beginner - your technique will help a lot! Thanks again! Super tutorial. Thank you for the clear and simple directions. Looking forward to trying this. 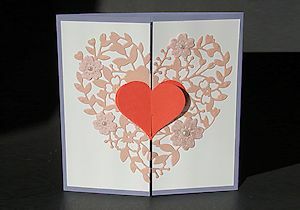 I like this too especially if you just want a gate fold not just Valentine but can keep it closed. Thank you for the great Tutorial. 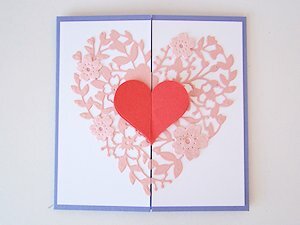 It is a great way to make a beautiful and simple card very elegant. Very nice, love the card. That card was so cool. Will have to say, you made it look so easy. I made it too and thanks so much for putting this on. Loved this tutorial, you make it look so easy. Thank you. Brenda Quintana is a Stampin' Up! demo who lives in the Boston area. She loves to design things that pop and wow! !